I’ve been to a lot of good restaurants lately, but it’s been a while since I walked away feeling that I just experienced true greatness. Feeling full, but wanting more…plotting my next visit, counting the menu items I must try. 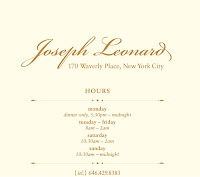 Joseph Leonard was that experience for me. It’s a 35 seat joint (including bar seating) just off of 7th Avenue on Waverly. Its homey, like a hipster grandma’s living room (is there such thing?). It’s got a village charm and coolness, and doesn’t feel like its trying too hard. When we got there, we learned that restaurant just reopened – that week – with an updated menu and wine list, as it was closed for two months due to a basement fire. The menu was exciting… not exotic… but had the type of items that just made your mouth water: a warm octopus salad, crispy braised pork hock, roasted brussel sprouts with siracha, YUM! And, the little open kitchen filled the small room with a perfume of goodness that keeps you on the edge of your seat. We sat down to a jar of homemade sour gherkins – my date who has an aversion to sweet pickles was thrilled. For an “amuse-bouche” we were served homemade potato chips with sour cream an onion dip… Could there be anything better? For appetizers, we then opted to share deconstructed clam casino and the warm octopus salad – a definite highlight. For a main course, we split the New York strip which was perfectly medium rare, and the roasted cauliflower and roasted brussel sprouts with siracha – they were extremely hot and addictive. 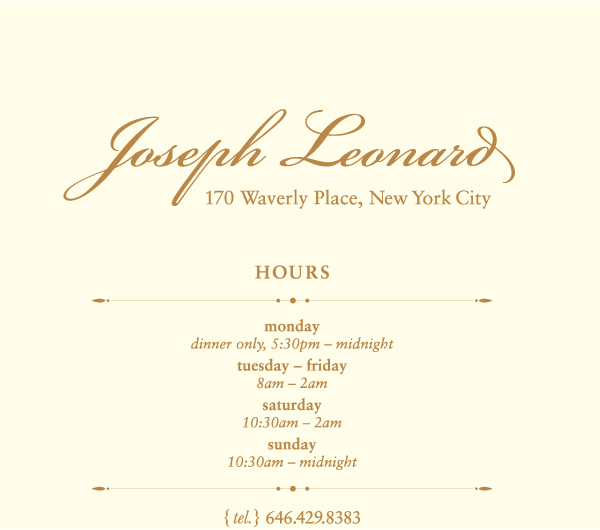 Joseph Leonard is not for the faint of seasoning… each dish has big, bold flavors. The destructed clams casino was too salty, but everything else was perfect for my palate. I am counting the days until I can return. Next on my list to try – the crispy braised pork hock. You had me at "sweet pickles"!